"I have three months without a salary before I’m a member of Congress. So, how do I get an apartment?" Alexandria Ocasio-Cortez speaks at a rally calling on Sen. Jeff Flake to reject Judge Brett Kavanaugh's nomination to the Supreme Court on Oct. 1, 2018 in Boston. Would you be able to rent a D.C. apartment if you didn't get paid for three months? Congresswoman-elect Alexandria Ocasio-Cortez said she can't. The New York millennial told The New York Times in a story published Wednesday that she needs to wait until her congressional salary kicks in to get an apartment in D.C., which ranks among the most expensive cities in the country for renters. Ocasio-Cortez told the Times she was preparing to move to D.C. but the time before she leaves New York will be "very unusual, because I can’t really take a salary. I have three months without a salary before I’m a member of Congress. So, how do I get an apartment? Those little things are very real." She said she and her partner were "squirreling away and then hoping that gets me to January." After a Times reporter's tweet about her comments went viral, Ocasio-Cortez tweeted about the situation. "There are many little ways in which our electoral system isn’t even designed (nor prepared) for working-class people to lead. This is one of them (don’t worry btw - we’re working it out! )," she wrote. Ocasio-Cortez, who will represent parts of New York City, started the year as a bartender. She will make $174,000 per year as a member of Congress. The median rent for a one-bedroom in D.C. is $2,170, according to a report released this month by the real estate startup Zumper. That gives D.C. the seventh-highest rental costs in the country. On Twitter, some people sympathized with the congresswoman-elect. Others thought she would be just fine. That's reality for a lot of people. Will be nice to have someone in Congress that literally understands the struggle. The fact that it's such an oddity tell you a lot of about who really is "supposed to" get positions like this and who isn't. Not sure at all thatit's an oddity, it is that she is showing the real deal. Many members of Congress share apartments or homes. They usually still have a home in their district that must be paid for as well. Start a go fund me! Ocasio-Cortez, 29, is the youngest woman ever elected to the U.S. House of Representatives. The democratic socialist defeated Rep. Joseph Crowley, the No. 4 Democrat in the House. 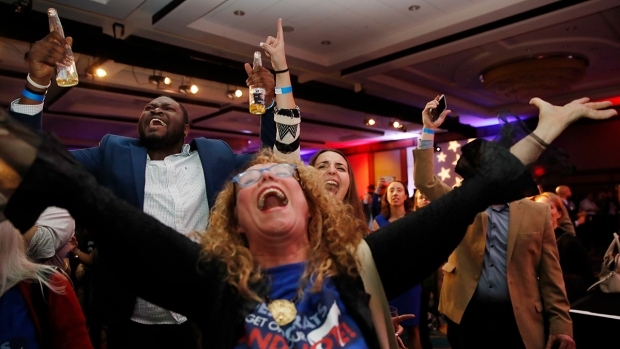 Her victory shocked her as much as it shocked the political establishment. She clapped her hands to her mouth on live TV as she watched the results at her campaign watch party.